Dette produktet oppfyller betingelsene i derektivene 89/336/EEC og 73/23/EEC i endringen 93/68/EEC. • Doing so will damage the surface (green portion) of the drum cartridge, causing smudges on copies. from the package before use. • Doing so will damage the surface of the cartridge, causing smudges on copies. or copyrights of Microsoft Corporation in the U.S.A. and other countries. Acrobat, and the Acrobat logo are trademarks of Adobe Systems Incorporated. This manual contains explanations of the product and procedures for using the machine as a copier. This manual explains the procedures for using the machine as a printer or a scanner. and procedures for establishing initial printer settings. 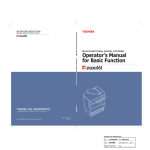 This operation manual refers to the Single Pass Feeder as the "SPF". is the same on both models. • First-copy time*1 at 300 dpi*2 is only 7.2 seconds . *1 First-Copy time may vary depending on the power-supply voltage, ambient temperature, and other operating conditions. a printed or scanned image. • High-quality copying at 600 dpi is performed. and "PHOTO" for photographs. The exposure can be adjusted to five levels in each mode. • Zoom copies can be made from 25% to 400% in 1% increments. controlled by enabling audit mode. the keys are designed to be usable by as many people as possible. Open to make copies from the document glass. Use to move the machine. Copies and prints are deposited to this tray. face up here. Holds up to 40 originals. push down on these levers and remove the paper. and transmission of the scanned data. receiving print data and while printing is paused. Lights up when the machine is in a power save mode. error code when an error occurs. Use to adjust the TEXT or PHOTO exposure level. original size will light up. Use to check the total number of pages scanned. Use to check the total number of copies made (p.64). Open the carton and check to ensure that the following components and accessories are included. • If anything is not included or is damaged, contact your authorised service representative. step 2 in the front of the paper tray. Remove the pressure plate lock. plate of the paper tray. the power cord into the nearest outlet. to the machine will result. guides until it locks in place. indicator ( ) will go out. that the TD cartridge is correctly installed. indicator ( ) will blink. reverts to the initial settings, all settings and functions selected to that point are canceled. The "Auto clear time"
operation panel is pressed, an original is placed, or a print job is received. Normal operation also resumes automatically when a print job is received or scanning is begun from a computer. and approximately one minute after the last copy is made in any mode. when the selected paper tray is not installed or is improperly installed. *1 A5 can be used in the upper paper tray but cannot be used in other trays (including trays in optional paper feeding unit). about 100 pages have been printed. The output may not stack correctly if more than 100 pages are allowed to accumulate. *3 The number of sheets of the paper which can be set changes with the weight of a paper. machine. Before using special paper, contact your authorised service representative. ● Before using other than SHARP recommended paper, make a test copy to see if the paper is suitable. Make sure that the machine is not copying or printing, and then follow these steps to load paper. the tray (up to 250 sheets). on the right side of the tray. a single stack with the new paper. the way into the bypass tray. • Up to 100 sheets of standard copy paper can be set in the bypass tray. flaps (not the closure flap). Do not use the following envelopes, as misfeeds will occur. • Envelopes with metal tabs, clasps, strings, holes, or windows. • Envelopes with rough fibres, carbon paper, or glossy surfaces. • Envelopes with two or more flaps. • Envelopes with tape, film, or paper attached to the flap. • Envelopes with a fold in the flap. • Envelopes with glue on the flap to be moistened for sealing. • Envelopes with labels or stamps. • Envelopes that are slightly inflated with air. • Envelopes with glue protruding from the seal area. • Envelopes with part of the seal area peeled off. Follow these steps to change a tray’s paper size setting. set the selected paper size. paper or a misfeed, or during interrupt copying. • During printing (even in copy mode), the paper size setting cannot be changed. • A5 size paper can only be selected in upper paper tray. • Do not load paper that is a different size than the paper size setting. Copying will not be possible. (ENTER ) to select the paper size. wish to change the paper size setting. slot as marked on the tray. indicator line of the paper to be loaded. right end of the tray. DRIVER" (p.11) in the "Software Setup Guide". This section explains how to make a regular copy. If "Auditing mode" has been enabled (p.43), enter your 3-digit account number. key (ENTER ) and select the original size. SELECT] key ( ) and copy from the bypass tray. ● The bypass tray must be manually selected. select the paper with the [TRAY SELECT] key ( ). copying in the middle of a run. been left on the document glass. size of the original lights up. • The sizes of paper that can be loaded vary by country and region. pressed or when "Auto clear time" activates. up as shown. To replace the cover, do the reverse. The SPF cannot be removed. of 30 pages can be placed at once. folds or creases well before placing. cause misfeeds or smudging and unclear images. • Carbon paper, thermal paper. • Originals that are creased, folded, or torn. • Glued originals, cut-out originals. • Originals with binder holes. original being copied. The exposure is lowered for coloured areas and background shadows. ● TEXT.......The exposure is raised for light areas and lowered for dark backgrounds to make text easier to read. ● PHOTO ...Halftones in the photo are reproduced with greater clarity. key ( ) to adjust the exposure. the AUTO indicator ( AUTO ) lights. copy or use the bypass tray), press the [TRAY SELECT] key ( ) to select the desired tray. • If the desired PAPER SIZE indicator does not light up, change the paper in the tray to the desired paper size. Press the numeric keys to set the number of copies. possible with the display showing "0". also stop after about 500 pages and 750 pages. The zoom function enables precise copy ratio selection from 25% to 400% in increments of 1%. There are three ways to enlarge and reduce copies, as explained below. • Reduction and enlargement ratios can be selected automatically with the [AUTO IMAGE] key ( AUTO % ). • Separate settings can be selected for the vertical and horizontal ratios. the original size is A5, A4, A4R, B4, A3. Press the [AUTO IMAGE] key ( AUTO % ). [AUTO IMAGE] key ( AUTO % ) again. change the orientation of the placed original. copied image may run off the page. pressed to select the ratio in increments of 1%. to select the desired copy ratio. the display for about two seconds.
) to increase or decrease the ratio. until the 100% indicator lights up. The XY ZOOM feature allows the horizontal and vertical copy ratios to be changed independently. Example: Reduction only in the horizontal direction. then the XY ZOOM feature. • The XY ZOOM feature cannot be used in combination with the AUTO IMAGE function. Ratios that can be selected will vary depending on the position of the original. Press the [XY-ZOOM] key ( ). the ratio in increments of 1%. The ratio appears in the display. ratios, beginning with the vertical ratio. To perform manual two-sided copying, follow these steps. Place original B as shown below. creases, or a poor-quality image. The copy is delivered to the paper output tray. making copies of books and other dual page originals on individual sheets of paper. A4 paper is used for dual page copying. When used in combination with XY ZOOM copying, enlargement is not possible. Dual page copying cannot be used in combination with the enlargement copying. Automatic ratio selection cannot be used when dual page copying is used. Dual page copying cannot be selected when an original is placed in the SPF. lower page number to the right. Set the original size to A3. off, indicating that the function is cancelled. the copy run will resume using the original copy settings. Interrupt copying is not possible when the user programs are being configured, or scanning is being performed. display. Enter your 3-digit account number. that the interrupt function is no longer operating. press the [START] key ( ). The interrupted copy run will resume. The machine includes a USB 1.1 port and a parallel port as standard equipment. A computer can be connected to these ports to use the machine as a printer or a scanner. • If a problem occurs in printer or scanner mode, see "TROUBLESHOOTING" (p.45). running Windows 95/NT 4.0 or using a parallel connection, only printing is available. • When interrupt copying is being performed, printing is not possible. the copy job is finished or scanner mode is exited, the print jobs will begin printing. occurs or the machine runs out of paper or toner, or when the drum cartridge reaches its replacement time. SPF is restored to a usable state. the printer driver help file. sure the paper that you wish to use is loaded. and select "Print" from the File menu. print settings in the printer driver. ( ) on the operation panel is lit. Setup Guide", or the printer driver help file. Click the "Print" button or the "OK"
off-line. Printing will be paused and the ON LINE indicator ( ) will blink. To cancel a print job, press the [CLEAR] key ( ) or the [CLEAR ALL] key ( ). To resume printing, press the [ON LINE] key ( ) to switch the machine online. tray manually, or load paper in the bypass tray and press the [ON LINE] key ( ) to begin printing. Printing will take place using a size of paper that is close to the size of the print image. • A misfeed has occurred (paper misfeed or original misfeed in the SPF). • The user programs are being used. • The tray paper size is being set. • Automatic exposure adjustment is in progress. • When the toner save mode setting is being changed. • The machine is being used in copy mode. • The front or side cover is open. and the scanned image will be pasted into the application. [CLEAR ALL] key ( ). COPY, PRINTER, AND SCANNER MODES". The six [SCAN MENU] keys can be configured separately in Button Manager. information on Button Manager settings, see the Button Manager help file. on TWAIN and WIA settings, see the help file for the scanner driver or Windows Help. *1 Can be used after pressing the [INTERRUPT] key ( ). *3 The print job is paused and copying begins. *4 The scan job is stored and scanning begins when the print job is finished. *5 The print job is stored in the computer and printing begins when the scan job is finished. custom settings that control fine points of the machine’s operation. adjustment is used, follow the steps below to adjust the automatic exposure level. The automatic exposure level can be adjusted separately for the document glass and the SPF. The copy, scanner and printer functions cannot be used while the automatic exposure level is being adjusted. Make sure that the SPF indicator is lit. / ) to select "PHOTO"
indicator ( AUTO ) blinks. document glass, proceed to step 2.
to check the new level. Toner save mode can be enabled to reduce toner consumption by about 10%. / ) to select "TEXT"
mode, press the [Dark] key ( ). The user programs allow you to customise the machine to match your needs. *1 On model with the SPF. *2 On model with the two trays. machine being used when the power is on. and automatically fed into the machine. tray). The function can be disabled. and print jobs when using the printer function. value not change when the key is held down. not function in copy mode. reverts to the initial settings. "PHOTO" as the default exposure mode. The display shows "- -"
) and return to step 2.
wish to change the volume of the beep signals or disable them, see "Audible signals volume" on page 39. Use to enable or disable "Auditing mode". "Auditing mode" is initially disabled. Use to change an account number. Use to delete an account number. exceeded, the count will start over from 0. Use to reset the copy count of an account to 0.
procedures on the following pages. and return to step 2.
error code "13E" will appear in the display. All account numbers will be deleted. error code "11E" will appear in the display. then press the [START] key ( ). confusion when totalling account values). code "12E" will appear in the display. ratio display] key ( ). 2 Hold down the  key. is displayed sequentially as shown below. The display will show 3 blinking hyphens "- - -". in the display. Enter a different number. The copy counts of all accounts will be deleted. When you enter your account number, "0"
when finished to exit interrupt mode. CLEAR] key ( ACC.#-C ). The following problems are related to the general operation of the machine and copying. → Plug the machine into a grounded outlet. → Turn the power switch ON. made until the machine has finished warming up. → Close the front cover or the side cover.
) to resume normal operation. PAPER SIZE indicator is blinking. tray. Change the paper size setting. • Use the [TRAY SELECT] key ( ) to change the tray selection. • Open and close the tray. Select the correct original type for the original. Copies are too dark or too light. ), adjust the automatic exposure level. original and the size of the paper. is too much blank space. using the appropriate ratio for the original and paper. changing the tray's paper size setting. change the size of paper loaded in the tray. → Do not use curled or crimped paper. Replace with dry copy paper. → To remove the misfeed, see "MISFEED REMOVAL". → Make sure the paper is properly installed. → Remove all pieces of misfed paper. Some sheets of paper stick together. → Fan the paper well before loading it. → Adjust the guides to match the width of the paper. → When loading a large size of paper, pull out the extension. A5 paper is loaded in lower paper tray. curled or folded. Straighten the original. The original includes any large black solid areas. ENTER] key ( ENTER ) to select the paper size. The machine is directly exposed to sunlight. → Install in a location that is not exposed to sunlight. Copies are smudged or dirty. The scanner glass in the SPF is dirty. → Clean the long, narrow glass in the SPF. The transfer charger is dirty. → Clean the transfer charger. Copying or printing is performed. → Set the paper size after copying or printing is complete. → Load paper or remove the misfeed, and then set the paper size. An interrupt copy job is in progress. → Set the paper size after the interrupt copy job is finished. → Long copy runs are automatically paused every 250 copies. Any other indicators are lit.
) is lit or blinking. the display, and take appropriate action. software programs. To view a README file, see the "Software Setup Guide". → Wait until the copy job is complete. correct. Set the port correctly. applications, be sure you have selected "SHARP AL-XXXX"
and Other Hardware", and then click "Printers and Faxes". (where XXXX is the model name of your machine). AL-1633/1644 Software and then reinstall it. the printer driver, see the Software Setup Guide. The PAPER SIZE indicator is blinking. using a size of paper that is close to the size of the print image. size selected from the drop-down list of the "Fit To Paper Size"
option is the same as the size of the loaded paper. if the "Image Orientation" option is set to your requirements. The original is smudged or blotchy. driver will enhance the data to make up for the lower resolution. resolution setting, or scan a smaller area. using "White", "Red", "Green" or "Blue" mode from "Light Source"
the "Image" tab of the "Professional" screen. Adjustment" button on the "Colour" tab of the "Custom Settings"
the quality of the scanned picture" or the "Custom settings"
is still not possible, check the following items. the list, and remove the software. meaning of the indicator or message in the following table and take appropriate action. TD cartridge must be replaced. Replace it with a new one. Replacement of drum cartridge will be needed soon. Drum cartridge must be replaced. Replace it with a new one. • Press the [CLEAR ALL] key ( ). cover or the side cover. The drum cartridge or TD cartridge is not installed correctly. The PAPER SIZE indicator on the operation panel will blink. [ON LINE] key ( ) to begin printing. Check the blinking misfeed location indicator to identify the location of the misfeed and remove it. the drum will cause dirty copies. misfed original from the document feeder tray. Close the feeding roller cover. Remove the misfed original from the exit area. remained when the misfeed occurred. document feeder tray and remove the original. If paper is misfed here, go to "B.
Misfeed in the fusing area". If paper is misfed here, go to "A.
Misfeed in the paper feed area". Close the front cover and side cover. Carefully remove the misfed paper. Caution portion) when removing the misfed paper. portion) when removing the misfed paper. misfed paper soiling your hands or clothes. torn pieces remain in the machine. Close the upper paper tray. Open the lower side cover.
) lights up, the TD cartridge will need replacement soon. be replaced before copying can be resumed. Replace the TD cartridge by following the procedure below. up on the lock release lever. cartridge all the way out. cartridge in accordance with local regulations.
) lights up, little toner remains and thus copies may be faint. cartridge by following the procedure given below. Caution cover protects the drum against external light. gently pull the cartridge out. cartridge all the way into the machine. the toner level indicator or drum cartridge life, and cleaning the machine. can be counted up to 999,999. Example: Total number of pages output is 12,345.
total copy count from the total output count. pages, not the total output count. as a guideline for replacing the TD cartridge. ( ) for more than 5 seconds. long narrow glass surface on the right side of the document glass) become dirty, the dirt may appear on copies. Always keep these parts clean. the SPF and the scanning window on the document glass with a soft, clean cloth. If necessary, dampen the cloth with water. Do not use thinner, benzene, or similar volatile cleaning agents. roller at the feed slot of the bypass tray with a soft, clean cloth dampened with alcohol or water. If copies start becoming streaky or blotchy, the transfer charger may be dirty. Clean the charger using the following procedure. Lift and pull out the upper paper tray. pressing the handle on the cover. the arrow two or three times. smudges on copies may occur. Standard supplies for this product that are to be replaced by the user are paper, TD cartridge and drum cartridge. Only genuine SHARP consumables carry the Genuine Supplies label. When moving this machine, follow the procedure below. When moving this machine, be sure to remove the TD cartridge in advance. Caution be reinstalled to prevent shipping damage. the machine. See "SET-UP" (p.13). Please purchase a commercially available parallel cable. * The resolution may be enhanced by the scanner driver depending on the scanned area and colour mode. SOFTWARE, YOU ARE AGREEING TO BE BOUND BY THE TERMS OF THIS LICENSE. the FAR or, in the case of NASA, in Clause 18-52.227-86 (d) of the NASA Supplement to the FAR. SHALL CREATE A WARRANTY OR IN ANY WAY INCREASE THE SCOPE OF THIS WARRANTY. contract, tort (including negligence) or otherwise) exceed the amount paid by you for the Software.